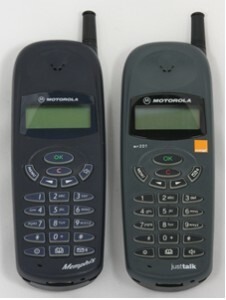 Motorola was known for its high status phones such as the £1400 StarTAC. However, the company also made bread and butter phones for those with more modest means. The Motorola d160 was poles apart from the StarTAC; it was big, heavy and cheap. This phone and its analogue cousin, the a130, were some of the first PAYG phones. The d160 had a rounded look, which some commentators found difficult to use. However, it was a reasonably well made phone, if lacking in features. It had no memory for numbers, you had to rely on the SIM card, and the menus were a bit fiddly. However, it did support text messaging if your network did. For One2One, Motorola rebranded the d160, as the Memphis. It was a deep blue colour and had a different keypad layout. The Memphis was One2One's entry level phone. The d160 also had the distinction being the first Orange PAYG phone. Orange launched PAYG, with the justTalk brand, towards the end of 1997 and offered only this phone. The phone cost £179.99. The Motorola a130 is the analogue version of the d160. It was available a year earlier and was one of three phones Vodafone offered when they re-launched Vodafone Pre-Paid as the more friendly 'Pay as you Talk' to compete with One2One's Up2You and Orange's justTalk.